search for a specific event, including pig or group identification, and then view and edit the history accordingly. 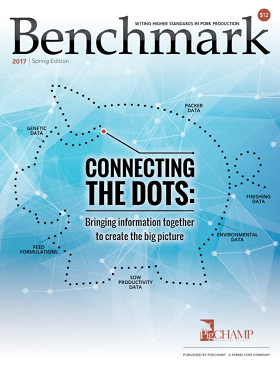 Each spring, PigCHAMP publishes our Benchmark Magazine which highlights our yearly Benchmarking summary report along with articles written by swine industry leaders. This year, our authors focused on the value of using multiple data sources to help create the big picture for your operation. You can read the 2017 edition along with the previous 10 Benchmark Magazines on our website. Want to be added to the mailing list in 2018? We shared with you last month about having the honor of being a finalist for the New Product Tour at World Pork Expo. The up-and-coming Knowledge Center will provide web-based access to Benchmarking stats and rankings, Statistical Process Control (SPC) charting, and dashboard guages. other contest finalist, follow this link to the National Hog Farmer website. Learn more by viewing our product sheet here.